Having become one of the emblems of the AEROWATCH watch manufactory, the 1942 case now adorns the latest automatic Chronograph in a limited edition of 500 pieces. After introducing its wristwatch concept seven years ago, AEROWATCH SA presents the “1942 Chronograph” in a new finish. The 1942 range is the flagship line of its collection and embodies strong archetypes that characterise the company, based in the Swiss Jura. 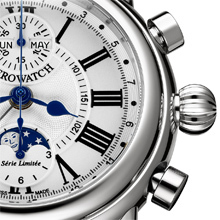 With its timeless style, the 42.00 mm diameter steel case has a domed sapphire crystal. 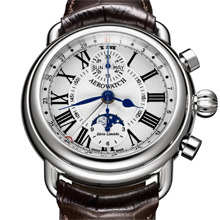 Its silvered dial, engine-turned at its centre and featuring Roman numerals, gives it style and elegance. 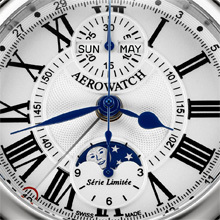 For this new timepiece, AEROWATCH has chosen to make visible the self-winding chronograph movement, decorated in the purest tradition of Swiss watchmaking, through a transparent case-back. “The new 1942 Chronograph” has a beautifully balanced face complete with full calendar (date, day of the week and month) and phase of the moon at 6 o’clock. The brown leather strap has a personalised folding clasp to keep the watch securely on your wrist. Intended for enthusiasts of fine watchmaking, AEROWATCH offers a chronograph of the highest quality, with complications, at a very competitive price. “The 1942 Chronograph” is available from exclusive AEROWATCH points of sale. • Brown leather strap with personalised steel clasp.